First of all, this has nothing to do with the Bruins. But in a situation like this, it doesn't matter. Anytime a goalie nets one (as long as they don't play for Montreal or Vancouver), it's something that the whole league (minus the team being scored on) can enjoy. And yes, we're talking about the goalie scoring in the other teams net (if it was an own-goal than either Montreal or Vancouver would be perfect). If you have no idea what's being discussed here, than you missed something. On Saturday night, in the waning seconds of the Phoenix-Detroit game, Coyotes goaltender Mike Smith got hold of the puck, and decided he was going to try to Brodeur one into the Red Wings goal 178 feet away. He did. But this wasn't just your average goalie-goal (I know what you're thinking, average goalie goal). Okay, well maybe there aren't any average goalie-goals, but this one is extra-special, particularly because of it's timing. Smith got the shot off just in time, as the puck crossed the line with one tenth (0.1) seconds left on the clock! Check out the video below, and prepare to be amazed. Comment Question: What did you think of the goal? Earl. 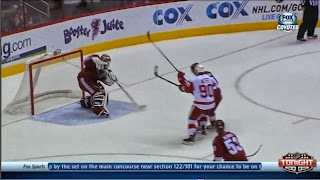 "Phoenix Coyotes Goalie Mike Smith Scores Empty Net Goal (VIDEO)." N.p., n.d. Web. 21 Oct. 2013. <http://www.totalsportsblog.com/tag/goal/>.